In the run-up to the 2015 general election, Mencap wanted to make sure that people with learning disabilities were fully engaged in the democratic process. The charity started work on the initiative by carrying out a data-capture exercise in spring 2014 and mobilising its local groups and e-campaigners. 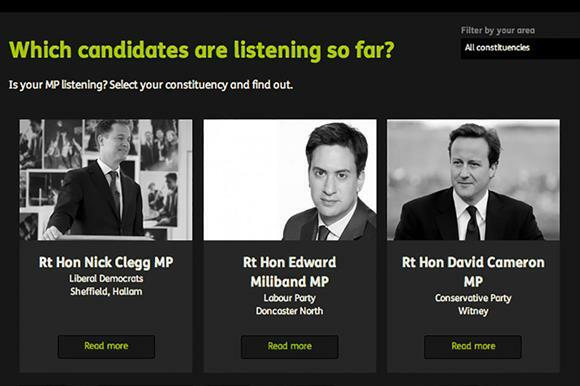 Towards the end of the year, Mencap launched a microsite that enabled users to post messages to their local candidates. Candidates could also post messages. The charity also published easy-to-read versions of the main parties' manifestos and encouraged people who had signed up to share their own personal stories online. The campaign smashed Mencap's targets. The charity had hoped users would post 100 personal stories but ended up with 1,000. Mencap had wanted 75 election candidates to pledge to represent the views of people with learning disabilities, but 832 signed up, including the three main party leaders and 151 MPs in the new parliament. Chris Michaeloudis, director of development at nim design, said: "This is an excellent way of using digital technology for social issues."